What happens when you get hundreds of project managers in the same venue? You need a conference convenor! 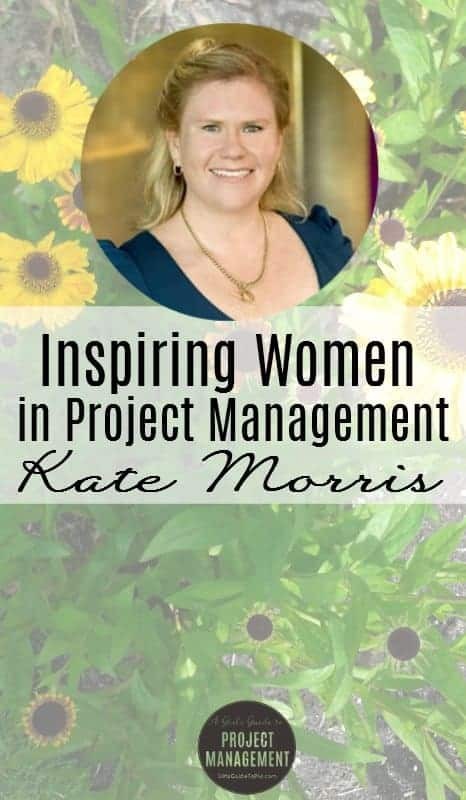 Kate Morris, MSP, MoP, CSM, my Inspiring Women in Project Management interviewee this month, is taking on that lead at the upcoming PMI Australia Conference 2017, but she’s more than just an MC. A practising project manager, I spoke to Kate about her current role and what it means to be taking the stage in front of such a significant audience. Here’s what she had to say. 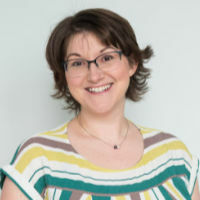 Kate, how did you get started in project management and what is your current role? I found a wonderful mentor who saw the potential in me. She took me under her wing and gave me a love of project management that has stayed with me till today. Currently I’m working in an assurance and advisory role where I consult on setting up programs for success, complete deep dive in-flight reviews and manage the post implementation reporting process. With 15 years’ experience in technical and business transformation programs, I provide insight on best practice delivery, integrating the human aspects of implementing projects. Sharing these experiences and passion is one of the reasons I joined the PMI and the PMI Sydney Chapter board. What do you wish you had known before you started? I could have avoided so many rookie mistakes, if I had leaned on my network earlier. How much the PMI community offers! I could have avoided so many rookie mistakes, if I had leaned on my network earlier. 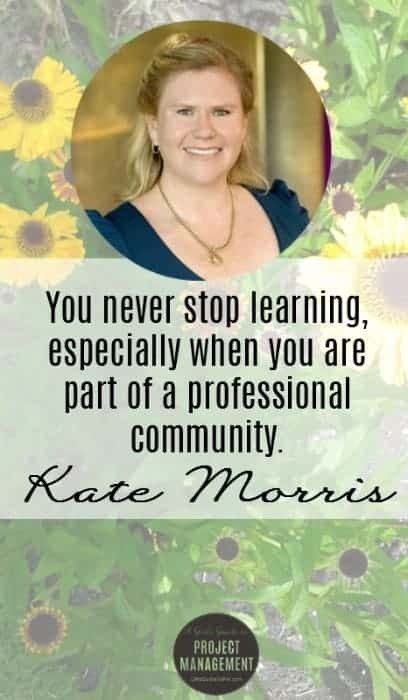 I believe you never stop learning, especially when you are part of a professional community. And you learn best by giving and paying it forward. So what is your biggest challenge in your career right now? Promoting the need for good project professionals in organisations. I believe there’s a limited understanding of the skills senior management need to sponsor large programs. Research tells us sponsors who understood their role on a project/program had greater success. Equally, a project manager acting as a trusted advisor, and acquiring a sponsor’s confidence can discuss all aspects of the project honestly. Both project managers and sponsors need to invest in learning new skills to achieve better outcomes. I know you are a firm believer in positive leadership. Can you give some examples of how you implement that at work? By implementing Gallup Strengths in my team, I was able to assign projects, project resources and delivery outcomes complementing their individual strengths, resulting in better outcomes and a happier team. I loved encouraging different perspectives and collaboration. In turn, my team developed a deeper understanding of their strengths. And this learning in skills assessment was adopted by other teams, benefitting individual team members and the company. That’s a great result. What advice do you have for women in project management? Understand what you bring to the table. My skills sets are not the same as my male counterparts and that’s a fantastic thing! I am where I am today because I offer a different perspective. Invest time in understanding your strengths and improving. Knowing what you do best and how you achieve satisfaction from your job is so powerful. Knowing what you do best and how you achieve satisfaction from your job is so powerful. You are the Conference Convenor for the PMI Australia Conference 2017. Tell us about that role and what it entails. Essentially, I am the project manager assigned to deliver aspects of our national Conference. This is a challenging role, especially when you’re leading a group of your peers. But working with the PMI is so rewarding, it allows me to use my skillset and project knowledge in different applications. Most of all, I get to work with a dedicated and talented group of professionals, focused on delivering a world class conference sharing best practice. What is the theme for this year’s conference? Level Up – Lifting the game of success highlights the ever-changing landscape of our profession, and the business and academic community. The theme recognises the need to strive for improvement from individual practitioners to businesses facing remaining competitive with less resources. The Conference brings best practice thought leadership skills and training to help raise project team members to the next level. Delegates will acquire the latest tools and techniques to drive business growth and performance. And, we’ll showcase how project management is leading the fight for business performance, ensuring growth, leading change and aligning project with strategy. Is there anything new this year? This year’s conference has definitely “levelled up” by introducing an Academic Research stream and sharing this knowledge with a wider community of professionals and business leaders. Great. Aside from that research track, what should people expect to get out of attending the PMI Australia Conference? A brilliant experience – offering new ways of thinking, problem-solving and skills. Plus abundant opportunities to meet like-minded Australian and international professionals and organisations interested in collaborating and prospering. A celebration of the contributions of all project management professionals, especially those nominated for the PMI Australia Awards. Above all, you’ll be able to apply what you learn and share this knowledge to elevate your success and that of your teams and projects. Overall, the Conference will deliver an invaluable ROI to help you lift your game of success.